Daniel Henry Kahnweiler, Paris, by whom acquired from the artist. Dr. Herschel Carey Walker, New York. Acquired from the above by the present owner in the late 1980s. Exh. cat., Léger, Staatliche Kunsthalle, Berlin, 1980 (illustrated p. 137). G. Bauquier, Fernand Léger, Catalogue raisonné 1903-1919, vol. I, Paris, 1990, no. 77 (illustrated p. 144). G. Bauquier, Fernand Léger, Vivre dans le vrai, Paris, 1987 (illustrated p. 61). New York, Acquavella Galleries, Léger, October - December 1987, no. 9. Painted in 1914, Les maisons dans les arbres is a searingly modern reinvention of the landscape as seen by Léger at the turn of the Twentieth Century. This is a pastoral view for the age of the machine, a work filled with forms that speak of science, surface, analysis and form rather than the vague and, to Léger, pointless aesthetics that had driven so much of the art that had come before. 'If pictorial expression has changed, it is because modern life has necessitated it. The existence of modern creative people is much more intense and more complex than that of people in earlier centuries. The thing that is imagined is less fixed, the object exposes itself less than it did formerly. When one crosses a landscape by automobile or express train, it becomes fragmented; it loses in descriptive value but gains in synthetic value. The view through the door of the railroad car or the automobile windshield, in combination with the speed, has altered the habitual look of things. A modern man registers a hundred more sensory impressions than an eighteenth-century artist' (Fernand Léger, quoted in E.F. Fry (ed. ), Functions of Painting, London, 1973, pp. 11-12). In Les maisons dans les arbres, the contrasts between the jostling geometric elements in the work are a far cry from Nicolas Poussin, Théodore Rousseau or Claude Lorrain: the pastoral has been dismissed and replaced with a pulsing view that conveys direct information, discarding what Léger considered as superfluous and sentimental values. Les maisons dans les arbres is part of a small series of paintings on the same theme that Léger executed between 1913 and the beginning of 1914 in a period of intense productivity that was to be violently altered, though by no means stopped, by his being called up for duty on the front line during the First World War. The landscapes had begun as a facet of his exploration of the Contraste des formes, which was the title he gave to many of the earlier works. By 1914, the various different themes-- smoke over the rooftops of the city, people on the stairs, houses in the woods-- had been granted their own titles rather than the umbrella Constraste des formes, yet this contrast is still clearly the focus. In Les maisons dans les arbres, there is a jarring interplay between the rounded forms of the green foliage in the trees and the jutting angularity of the jumbled houses in the settlement that dominates the centre. This perfectly encapsulates Léger's statement that, 'Contrast = dissonance, and hence a maximum expressive effect' (Fernand Léger, ibid., p. 16). 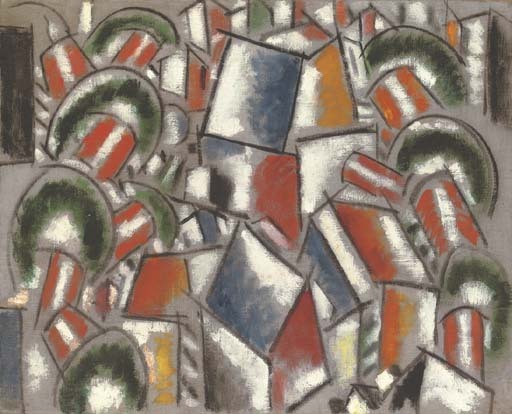 During the first half of the 1910s, in the run-up to the beginning of the First World War, Léger was part of a wide-ranging yet tight-knit group of avant-garde artists working in Paris, all pushing back the boundaries of art and representation, seeking to find a visual idiom appropriate to the modern, scientific age of mechanised transport, of speed and locomotion. Léger spend time living at La Ruche, the notorious building in Montparnasse that was largely peopled by impecunious artists, whose roll call included Soutine, Chagall, Lipchitz and crucially Delaunay. These artists were often also friends with those in the Bâteau Lavoir in Montmartre, meaning that Léger was exposed to a panoply of movements including Cubism, Orphism and Futurism. Indeed, Léger in particular was directly linked to the first two of those movements, and was considered to be close to the Futurists in many ways as well. In Les maisons dans les arbres, the Orphism-- a movement whose name was coined by Léger's friend, the poet Guillaume Apollinaire-- is evident in the swirling forms of colour. Yet here, colour is being used not as an entity in its own right but merely to accentuate the contrasts between the various forms. While the forms, and the use of geometric shapes to translate the actual masses and contrasts that exist within the view of a landscape, relate to Cubism, Léger's work is nonetheless distinct from the Cubism either of Duchamp-Villon, Gleizes and Metzinger, as it was from that of Braque or Picasso. Like so many of the Cubists, Léger shared an interest in Cézanne, and this is evident in various aspects of Les maisons dans les arbres, not least the subject matter itself, one that the Master of Aix explored repeatedly, contrasting the forms of nature with those that were man-made. The rethinking of the act of representing the world on a two-dimensional surface was itself a legacy of Cézanne, as too is the curious stillness in the landscape works in particular. Crucially, Léger had his own form of colourism that distanced him from many of his contemporaries: using a visual language that echoes print and other mass media, and which suited Léger's needs because of its increase of contrast and dissonance, he limited himself to a small number of bold, unmixed colours. In Les maisons dans les arbres, this is evident in the use of black and white, as well as blue, green and red, each untrammelled in order to heighten their impacts. 'I will always remember that one year, showing at the Salon d'Automne, I had the advantage of being next to the Aviation Show, which was about to open. Through the partition, I listened to the hammers and the mechanics' songs. I jumped over the barrier, and never, in spite of my familiarity with these spectacles, had I been so impressed. Never had such a stark contrast assailed my eyes. I left vast surfaces, dismal and grey, pretentious in their frames, for beautiful, metallic objects, hard, permanent, and useful, in pure local colours; infinite varieties of steel surfaces at play next to vermilions and blues. The power of geometric forms dominated it all' (Fernand Léger, quoted in ibid., p. 60). Léger sought to inspire a similar awe in the modern viewer, a similar understanding of the truth of the forms that make up the world, rather than a superficial and cosmetic sense of aesthetic value. He referred to the paintings in the Salon d'Automne as 'Nothing more... than vaporous shadows in old frames' when compared to the vibrant modernity and relevance of the aviation machines and even the workmen who were their custodians (Fernand Léger, quoted in ibid., p. 61). It was with a desire to create something that was relevant and democratic that Léger painted. He sought a style that reflected the beauty of the machine and that would appeal to the simple tastes (as he perceived them) of the working men of France. It is a tribute to the importance of Les maisons dans les arbres that it was owned not only by Léger's first dealer, the famous Daniel-Henri Kahnweiler, but also by Stephen Hahn, through whose hands many of Léger's greatest works passed. Before going to Hahn, it had been owned by Dr Herschel Carey Walker, a legendary New York collector who owned a wide range of modern masterpieces, many of which are now in collections such as the New York Museum of Modern Art, a testimony to their importance.